If there’s one shoe style that will see you through from Monday through to Sunday, it’s backless loafers. When humble loafers were spliced at the hands of Gucci Creative Director Alessandro Michele circa 2015, among the agenda-setting collection were reworked slip-ons, lashed at the back and lined with a furry interior, thus creating the ultimate easy shoes known as backless loafers. Like the more uptight mannish originals but combining slipper-like comfort, they’re still smart enough to pair with your 9-to-5 uniform, from suits to midi skirts, but better yet, they’re the perfect pairings to those tricky in-between ankle lengths such as calf-length dresses and culottes—double win. The best way to wear them on weekends is with ankle-grazing denim or simple dresses. Our only style rule is don't wear with tights—too likely to fly off your feet and also look a bit strange on your heels. Scroll down to see our edit; these styles are worth a touch of frostbite. 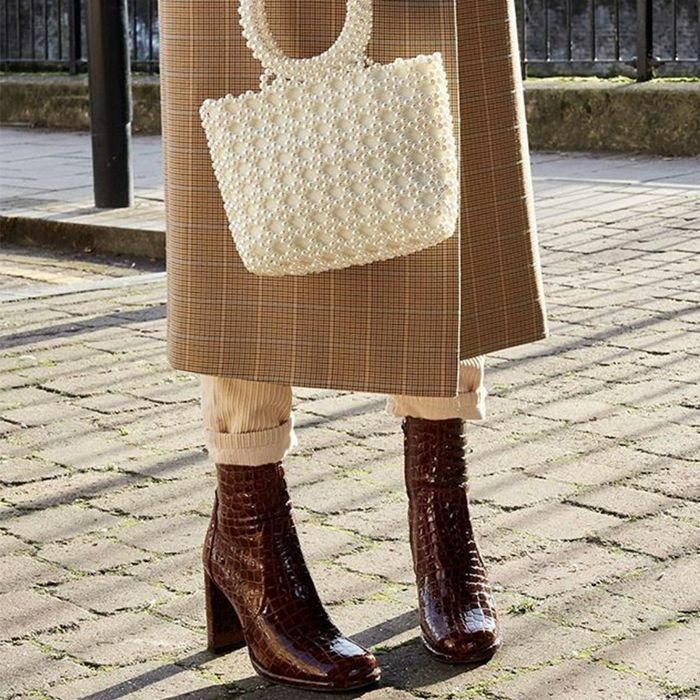 Style Notes: This season's knitted dress trend can be a tricky one to style, however Natasha Ndlovu makes it look easy with her favourite Gucci loafers and a smart backpack. Style Notes: Backless loafers are the perfect way to smarten-up stonewash jeans and a statement knit. Style Notes: We love this show-goer's twist on classic pieces: a shirt under a lacy slip and loafers with a fur trim. Genuis. Leopard print is everywhere this season. The classic that'll go with everything. This colour is very A/W 18. We love the mock croc effect on these Topshop loafers. A woven loafer feels very Mediterranean. These will look amazing with a colour-contrast suit. These have so many '60s vibes. An affordable yet stylish option. Your one-stop-shop for jazzing up an outfit. The ring detail on these looks so expensive. Hot pink is having a moment. This green velvet pair will look so luxe with black trousers.